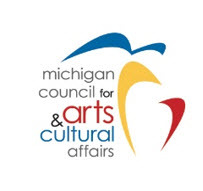 The mission of the Michigan Council for Arts and Cultural Affairs (MCACA) is to encourage, initiate, and facilitate an enriched artistic, cultural, and creative environment in Michigan. MCACA does this by increasing the visibility of arts and culture throughout the state, supporting arts education, encouraging new, creative, and innovative works of art and broadening cultural understanding. As a recipient of MCACA Minigrant Arts Project grant since 2009, Oakland County Children’s Village Foundation has had an opportunity to partner annually with the Birmingham Bloomfield Art Center (BBAC) to provide quality, hands-on art opportunities in a professional art studio to the children and youth residing at Oakland County’s Children’s Village. Program sessions are customized in such a way that respect is shown for not only the youths’ limitations, but their unlimited potential as well. By engaging children/youth in such creative art experiences, the program fosters personal growth, tactile experiences, and creative expression. The arts can also enhance one’s ability to develop and use coping skills, learn appropriate social skills, as well as develop a healthy outlet for future life stressors. This is especially true of the youth who enter Children’s Village, many of whom are considered to be underserved, minorities, disadvantaged, and emotionally impaired. As a result of this grant, individual youth who had an opportunity to participate in one or more of the BBAC classes have sought out additional art education classes within their local communities to participate in following their return home from Children’s Village. Please click on the links below for more information about the Birmingham Bloomfield Art Center, as well as the Michigan Council for Arts and Cultural Affairs. In addition, a link has also been provided for The Anton Art Center which is the Regional Regranting Agency that provided this award to the Children’s Village Foundation. There are not too many things that can empower troubled youth more than the opportunity to work with abandoned and mistreated dogs. Especially when this opportunity comes in the midst of working on their own troubles in a treatment program. Teacher’s Pet provides an exceptional opportunity for youth at Children’s Village to train dogs in preparation for adoption. In many ways the dogs experience with people is not so different from the youth’s experience allowing them to learn, trust, and grow together. Sometimes youth sit in on the adoption interview with prospective owners and sometimes they are able to have a family member adopt their dog who is then waiting for them when they return home. The Children’s Village Foundation sponsored the development and construction of on-site dog kennels at Children’s Village. The three season kennels are complete, comfortably housing up to six dogs in need of basic socialization and obedience training. The dogs will be trained by Children’s Village residents under the watchful eye of Teacher’s Pet volunteer staff. Upon successful completion of their training the dogs will be available for adoption. During their stay at Children’s Village the dogs will be sheltered and cared for by CV staff and residents. Please click on each dog’s name to read more about how these youth feel about their dogs, in their own words. The Teacher’s Pet program and dog kennels are supported through donations to the “Buy A Brick” program. For $100, a brick can be purchased which will be engraved with 2 lines of text, 25 characters per line. If you would like to purchase a brick through PayPal, enter what you would like engraved on your brick in the “Text to Appear on Brick” field (separate each line with two **) and then click on the “Add to Cart” button. We will contact you by email to confirm the brick’s text. Oakland County Children’s Village Foundation, 1200 North Telegraph Road, 63 West, Pontiac Michigan 48341-0144. Annie’s mission is to cultivate a healthier and happier world by spreading goodness through nourishing foods, honest words and conduct that is considerate and forever kind to the planet. Oh, and they believe in one more very important thing… having fun! Annie’s Homegrown offers grant awards to school gardens that connect children to real food and the Children’s Village Foundation was fortunate to have received a grant award in 2016. The boys and girls emergency shelter program have a 12′ x 12′ garden plot. The boys’ detention program have a 50′ x 60′ garden plot. The Gardens include a variety of vegetables, fruits, and spices. No chemicals are used on the produce. Garden Coordinators oversee the garden operations, with other staff assisting in instructing and supervising the children and youth. Under the guidance and supervision of the Garden Coordinators and staff, the children and youth cultivate the soil, plant the seedlings, water the plants, weed the garden, harvest the produce, and eat the garden produce. Students acquire basic gardening and horticultural knowledge and skills, learn about and appreciate where food comes from, and work cooperatively in groups to produce results. Special garden-related activities are also created for special-needs-challenged residents. The garden is a hands-on tool to teach students the importance of healthy eating. Garden responsibilities of watering and weeding enable students to touch, taste, and learn about the food they are growing. By growing produce, students better understand where their food originates; gain more positive food attitudes; build leadership, team work, self-confidence skills through ownership of a project and collaboration with others; ideally make smarter, healthier food choices outside of the facility and throughout their lives. The funds were used to purchase materials: tools, soil, lumber, seedlings, gloves, tomato cages, and rain barrels. Children’s Village is a licensed residential child care institution of 216 children with a fully accredited on-grounds school. This application was sponsored by the Children’s Village Foundation, an entirely volunteer group that raises funds for the children/youth of Children’s Village. Click on the Photo Gallery Tab to see pictures of the resident’s hard work. Learn more at www.annies.com/doing more/grants for gardens. Launched in 2014 by Chef Ann Foundation and superfoods company Healthy Skoop, Project Produce helps schools increase kids’ access to fresh fruits and vegetables and provides nutrition education through fun lunchroom learning activities. The grant program is designed to help create experiential nutrition education when and where students make their food choices: in the cafeteria. The $2,500 one-year grant supports food costs to incorporate fruit and vegetable tastings into the school’s nutrition program. The goals of Project Produce are to expand students’ palates and to increase their consumption of fresh produce. Under the guidance and supervision of the staff at the Children’s Village, the residents have been enjoying melon, pineapple and blueberries among other fruits and vegetables all provided for with this grant.